Let's talk about soaps, baby. Let's talk about you and me. Let's talk about all the good things and the bad things that may be. Let's talk abouuuut soaps. I'm a body wash kinda gal. I like my body wash I get from the store in the little squeezy tube, and I put it on my loofah, and I scrub a dub dub until I feel super clean and wonderful. Then I get out of the shower and moisturize my entire body because it's all so dry. I remember the first time I used lotion because I needed it, and not just because it was there. It was my eighteenth birthday. I thought, well this is it. This is the rest of my life. I will have to moisturize my face and body every day for the rest of my life or be left with a tight feeling face and large ugly pores. Poor eighteen year old self. I was so dramatic back then. And really skinny. 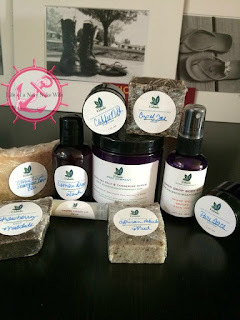 I met this really awesome lady recently (she is the owner of Kaleechi Soap Company!) that gave me some great products to try, which included four bars of soap. Being the body wash user I am, I gracefully accepted but inside wondered if I should use them, or just let my husband use them, and let him tell me about it. He's like my little guinea pig. He's very persuadable. When I think of soap, I think of the Ivory bars I used as a kid, that always left my skin feeling very dry. I remember trying to run my hand over my face after using Ivory, and my hand would catch because it wasn't very smooth, it was so dry. Icky. Eventually I got to a point where I had to try them. I went through everything else that I received, and it would be unfair to her generosity to not at least try it and give her a little feedback. I unhappily took my little Strawberry Mudslide soap bar and went to the shower unhappily one morning before my babies woke up. I'm so glad I did. I LOVE THIS SOAP. I went into this process wanting to try this Dead Sea Salt and Tangerine Scrub, and now I see that I should have been asking for the soap! I tried out four soaps; Citrus Lager Shampoo bar, Cup of Joe, African Black Mud, and Strawberry Mudslide. Citrus Lager is a shampoo bar, so you can use it on your hair too (although I used them all on my hair . . . ) it doesn't have anything extra in it to exfoliate your skin or hair, so it's like a creamy happy goodness. My husband really liked this one the best. If you're just starting out using bar soap, I think this is a great starter! It has a great lather, and it feels nice on your skin! Then I tried out the African Black Mud bar. Let's just take a second and discuss this. Mud. Soap. In one. Does that confuse you? It confused me. Who would have thought that soap with mud in it would be so delightful?! I didn't. It's great for rubbing off that dry skin and really feeling your best out of the shower. I couldn't believe how wonderful and clean MUD made me feel! Strawberry Mudslide. I tried this one thinking it would be a delightful and fun soap that was like Citrus Lager, but it's more like African Black Mud. It also has mud in it and also makes me feel great! I feel much cleaner than I did after using body wash and a loofah! Cup of Joe. Well that's silly. Rubbing coffee grounds on my body to be clean? Well you should, and you won't regret doing it. I even used these in my hair, and I just feel so much cleaner. My skin is a lot clearer too. So what did I learn here? Try new things, they might surprise you! I have been battling with dry spots on my shoulders since before I had my second child. They even flake a little from being so dry. The moisturizers I use never seem to go in deep enough to make a difference. But they're gone now. I wish I took a picture before and after, but this was a completely unexpected thing. I'm so happy with the results that Kaleechi has provided me! At first I went into this whole thing thinking "I just want to provide something more natural to my family" and fully believing that going natural was going to impact the effectiveness. I would be sacrificing quality in order to avoid chemicals. But that's not the case at all. If anything, going back to body wash is sacrificing. What is your wash routine. Do you use body wash or bar soap?? I received these products in exchange for my honest review. All of these views are my own though. I love trying new soaps. I have not tried this product but it sounds like one that I would like. I prefer to use bar soap in the shower and not body wash. These soaps sound delicious. I'd love to try them. Im a total body soap person too!! But you make this soap sound AMAZING!! I can't wait to try it!! I have never tried their products before. I would love to try the Strawberry Mudslide. I use body gels not any type of bar soap. 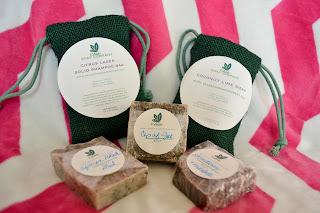 I would absolutely love to try the citrus lager shampoo bar! All of these sound like they smell amazing. I'm seriously OBSESSED with handmade soaps. Thank you for this review!! I love that it's a company local to where I grew up. I lived in Windsor, VA most of my life. I lived in Suffolk for my middle school years. It's great to see a local company getting a great promotion. This is a really great company too! She's the sweetest lady! We have gone out to dinner together since this, and she even invited me over for some biscuits and gravy breakfast!! That's awesome! It is a really nice place to live. I definitely miss it, but I do love being here in Tennessee. I would really like to try a sample of this soap. I've never heard of these products before, sounds like something I need to try out though!